It looks like they are reviving THE BATTLE OF THE NETWORK STARS!!! Okay, so the only reason I know about this show is because I ran into a clip of Melissa Gilbert when she did it! She competed against Kristy McNichol. I'm excited to see who will compete this time. They better have good stars like they did in the 70s... they had big stars competing! Anyway, it will be on ABC Networks and will start airing June 29th I believe. Keep an eye out! Pepperdine University has announced that a revival of the hit ABC television series Battle of the Network Stars will be filmed on the Malibu campus from late May through June 10. 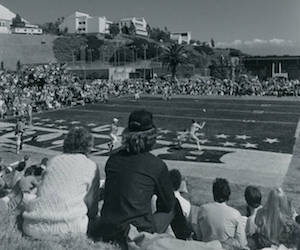 Host network ABC decided to return to the show's original location at Pepperdine where filming took place during the show's original run from 1976 to 1985. Produced by Glassman Media and IMG, the nostalgic 10-episode throwback show will once again assemble teams consisting of current and classic celebrities who will compete against one another in an array of physical challenges. For 13 seasons, the original version of the program featured television personalities from the three broadcast networks at that time, ABC, CBS, and NBC, as they participated in a variety of athletic events, including three-on-three football, tug of war, kayaking, miniature golf, and swimming. The late sports commentator Howard Cosell hosted all but one of the show's original 18 seasons as well as the show's first reboot in 1988. The show was last rebooted in 2003 by NBC. Like the original series, numerous celebrities from a variety of television networks will participate in friendly competition to raise money for charity. The show will not include an invited audience, but ABC will encourage the Pepperdine campus community to view filming from the sidelines of these competitive summer games and events. Filming times and locations will be announced for community members at a later date. Battle of the Network Stars is scheduled to premiere on June 29, 2017. I watched that show every week! I loved seeing the competition between the teams and stars!